TALK Miami Beach‘s special Spring activities are all about bringing students together and promoting moments of relaxation, fun, cultural exchange and English language practice. Whether outdoor or in-school activities, they are great opportunities to put into practice everything you learn in the classroom and strengthen ties with your new friends from around the world. The beaches and the city sightseeing are even more pleasant in the Spring weather, which is suitable for long walks and makes the city even more vibrant and its attractions, more glamorous. Check out some of the activities that the TALK team has prepared especially for international students who are learning English in the United States during the season. Earth Day is celebrated worldwide every April 22 to raise awareness about environmental protection and bring light to today’s environmental issues. TALK Miami Beach will collaborate with this initiative by joining the Earth Day Beach Clean-up and invites students to help clean the beach and give back to the environment as a thank you for all the beauties it gives us. Another activity that will put you in touch with the natural beauties of Miami is the bicycle tour on May 16 to celebrate the National Bike to Work Day, which takes place the next day. The tour lasts 45 minutes and is free. Rent a bike, do some exercise and enjoy the beauties of the city! In early June, we have a special program for fans of the cutest felines on the planet: coffee and “purr” therapy at Cat Cafe South Beach, a place that celebrates the friendship between cats and humans. Let’s have a coffee and enjoy the wonders of “purr” therapy! 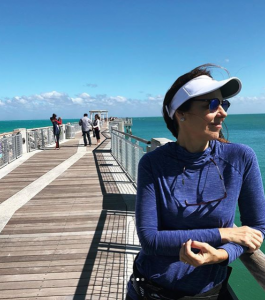 On June 22, TALK Miami Beach will host a picnic in one of the city’s most peaceful places, South Pointe Park Pier, which marks the ground zero of South Beach. There are 160 meters of wooden pier towards the sea and relaxing areas with a paradisiacal scenery. 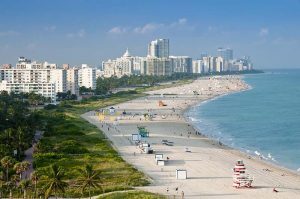 If after the picnic you feel like having a good walk, you can walk from Ocean Drive to Lummus Park and continue to Washington Avenue until Lincoln Road. Our potluck parties are the best! 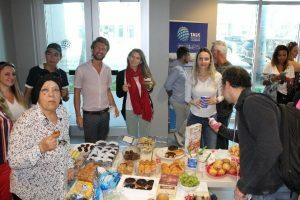 The cultural and ethnic diversity of TALK students is great and is very present on something that everyone loves: good food! In April, we are having a Mexican potluck and in June, a Colombian one. Yes, we love a good potluck party! Speaking of food, May 28 is National Burger Day, and our suggestion is a lunch with your colleagues at Shake Shack, a traditional American hamburger chain of restaurants, on Lincoln Road, one of Miami’s most cosmopolitan places and the heart of South Beach: a shopping and dining hub with the most diverse stores and restaurants. Keep an eye on the calendar of activities. Jackie Hammerton, Assistant Director of TALK Miami Beach, is available to answer all your questions. And for those who are still thinking about it, contact us now and get ready for the best Spring of your life! 📷 See more photos of TALK Miami Beach students having fun on our Instagram.